Copra cake, a by-product in the extraction of coconut oil from copra, is available throughout the year and is used almost entirely for animal feed. For feeding the cake is ground into meal. Because the protein content is about 20%, it is classified as a good source of protein, and is considered as good if not better than corngluten feed for dairy cattle. Copra meal is cheaper locally than either corn or fine rice bran-two principal ingredients in concentrate mixtures for dairy cows. Of the total amount of copra meal is produced in the Philippines. Only small quality is used by livestock raisers and poultrymen. Coconut oil in the Philippines is exported to Germany. 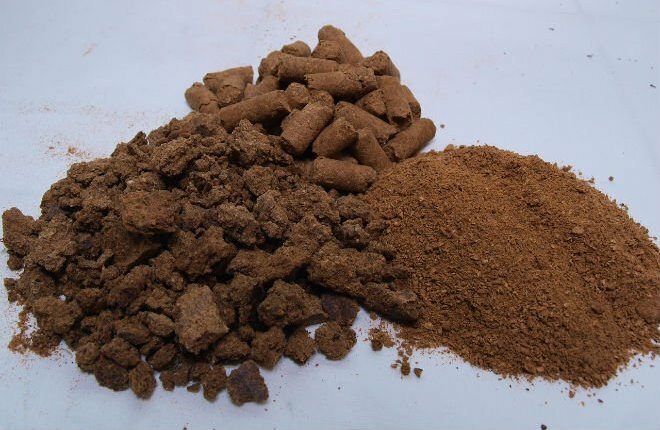 One of the objections to the use of high levels of copra meal for feed is its deficiency in certain amino acids, notably tryptophan, lysine, methionine, and histidine, furthermore, when the amount of copra cake in a ration is increased, the palatability decreases. It is also reported that pigs become constipated. When dairy feed containing copra meal is balanced with other the butterfat of the milk increases from about 3.8 to 4.0% when copra meal in the feed is increased from 35 to 55% (Castillo et al. 1961). According to Monongan et al. (1965) the feeding value of poultry and livestock rations containing 15 to 30% copra meal was improved with methionine and lysine supplementation. Chicks receiving supplements showed better growth, more efficient feed utilization and higher liver nitrogen than did those receiving copra meal without supplements. 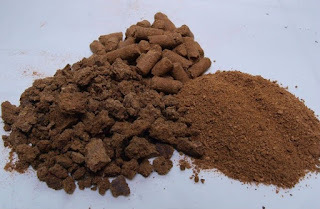 Copra meal is one of the most abundant and commonly used concentrate foods for swine in the Philippines, and is also used in other areas of the world where it is available. In general, it is fed largely to cattle and sheep. Copra meal is less digestible by swine than fresh coconut meal. Experiments showed that processing of copra by the expeller method lowered the digestibility of the proteins and possibly the carbohydrates. Digestive disturbances developed when concentrate mixtures of more than 50% coconut meal were fed to freshly weaned pigs (Loosli et al. 1954). Copra meal is a satisfactory substitute for fish meal in rations for swine. Garcia (1952) found that the differences in relative efficiency of the two sources of protein were insignificant. Copra meal is one of the cheapest and most easily available feed ingredient that can be utilized for poultry feeding in the Philippines. All of the copra meal from the Philippines is from hulled seed by the expeller method, and contains about 22% protein. There are certain problems connected with feeding of high levels of this ingredient. Copra meal was found to contain a toxic material that could not be washed out with water. When used in amounts less than 20% and when supplemented with 25% shrimp or fish meal, copra meal was a good ration for growing chicks. Laying chickens, however, tolerated from 20 to 30% copra meal in the ration with no adverse effects. It was a good substitute for wheat bran (Monongan et al. 1965). 0 Response to "Copra Cake and Copra Meal"